What Is DA Form 7382? The DA Form 7382, Sling Load Inspection Record is a form issued by the Department of the Army (DA) and used for documenting and inspecting all procedures related to sling load operations. The newest edition of the sling load inspection form was issued in July 2005 - an up-to-date DA Form 7382 fillable version is available for download below. The sling load inspection form is a part of the new scheme developed by the DA in order to improve sling load safety. The scheme consists of detailed sling load manuals and strict operational guidelines for all related procedures. All the army equipment moved by a sling load before the arrival of the supporting aircraft should be checked by the qualified inspector using the DA Form 7382. How To Use Da Form 7382 During Sling Load Operations? For use of this form, see FM 4-20.197; the proponent agency is TRADOC. 2. ITEM DESCRIPTION AND SERIAL/BUMPER NO. 6. RIGGED IAW FM NO. DA FORM 7382-R, MAR 97, MAY BE USED UNTIL EXHAUSTED. The first phase includes the preparation and rigging of the loads in accordance with the corresponding sling load manual. The second phase is an inspection of the load by a Pathfinder school Graduate, SLICC Graduate or an Air Assault School Graduate in the rank of E-4 or higher. All loads are inspected twice with the results of the inspection recorded in the DA Form 7382. The person who rigged the load is not allowed to check the same load. During the third phase, trained ground crews hook up rigged and inspected loads. When filing the DA Form 7382 digitally, all places where you can type or choose an option from a drop-down menu will be highlighted. Indicate the information about the supported and supporting aviation unit, item description, and weight at the top of the form. Next goes the list of items you need to check. Here you must initial the items applicable to your specific load only and insert your remarks at the end of the section. This section is divided into three columns: one with the list of items, the second for the person who rigged the load, and the third for the inspector. The next section is intended for personal information about the individuals who rigged the load: their unit, name, initials, rank, signature, and date of the operation. The last section is for providing the same identifying information about the person inspecting the load. Where can I find the DA Form 7382? You can find the form in TM 4-48. 09 Appendix I or Appendix H-2 of the AAS Handbook or download a fillable version above. How many copies of the DA Form 7382 must be filled out? 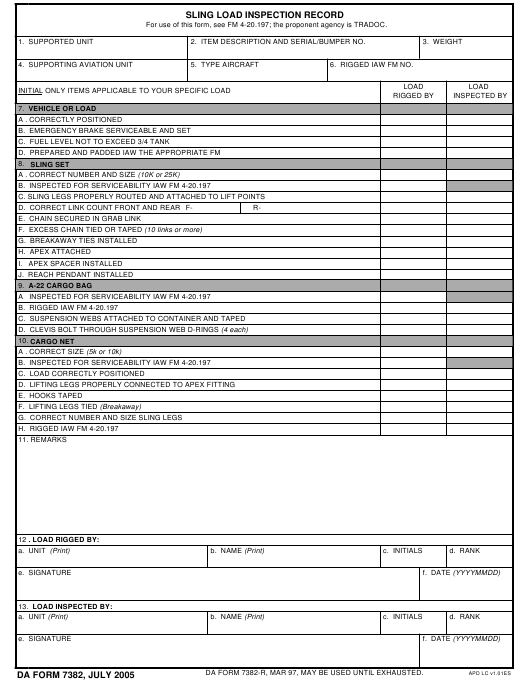 The sling load inspection form needs to be filled in three copies. What should be done with the three copies of the DA Form 7382? One copy goes to the supporting aviation unit, the second one is intended for the supported unit and the last one should be securely attached to the load. What are the four classifications of sling loads? Sling loads can be classified as Certified, Unique, Prohibited and Sustainable. What unit is responsible for the storage, inspection, and maintaining of all the sling load equipment? All of these goes under the responsibility of the Supported Unit. What types of units take part in sling load operations? There are three roles in total: Supported, Supporting Aviation and Receiving.